In 1992 lead vocals/writing in"A Fine Tooth Comb" in Steamboat Springs Co. In 1994 played bass/vocals in Doll Collection. In 1996 played bass/vocals in Doctor Mudd, In 1997-2000 formed Olga, in which I wrote the songs and played bass/vocals. 2000-‘til the rest of the world gets to hear us Mongoloidian Glow. Artist, photographer, oil maker, vegetarian personal chef/caterer, Union Carpenter, slightly schizophrenic, but hey , I’m having fun with it and generally paranoid because of the current government we live in. So the first band I played guitar was miotis invotis in 1993- 96 from York Pa. Then rocked in little miss suction out of Baltimore from 1997-99. Guitar in the headwounds since 2000. Tearing up drums and vocals in Mongoloidian Glow since 2000. In the fall of 1999, they decided to get together and have a jam of sorts both playing in different bands, looked at this as a fun diversion from their current bands at that time. When the drummer from Annbidextrious’ active band Olga seemed to disappear, they asked Katha to give it a try drumming for the being a guitarist she gave it a go after a few practices that trio seemed to dissipate. Katha’s current band Little Miss Suction seemed to fall by the way side as well so they decided to form a new band with two other members that each had played with in previous bands. Songs formed but practices dwindled and they seemed to be the only ones able to make practices. So, a duo was formed in addition to the four-piece project. There was a magical type of chemistry between them; Katha was just starting to drum and Annbidextrious, who had only played bass other projects was playing guitar. The four- piece ended, and they decided to road trip cross-country, where they debuted at Al’s Bar in Los Angeles Ca. Hence, Mongoloidian Glow was formed. They regularly play Baltimore, New York and New Jersey, with a large following. 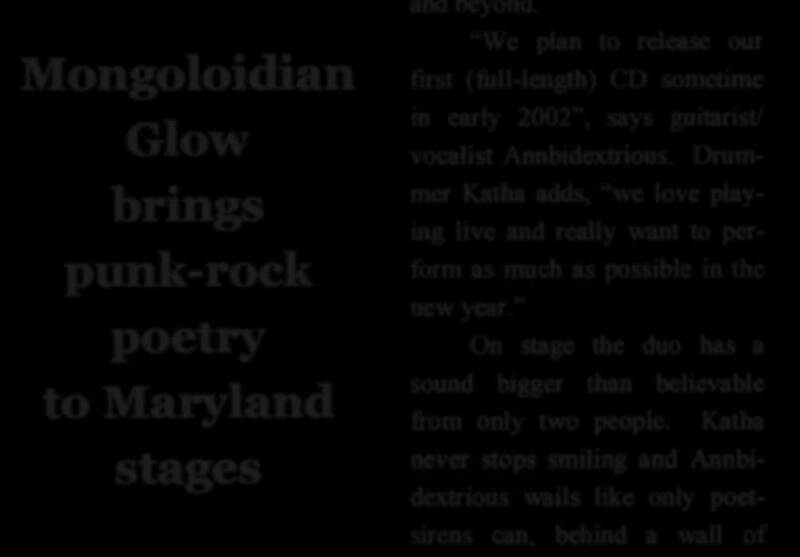 Dark and industrial, passionate, sonic and raw, with a sense of playfulness, Baltimore-based, Mongoloidian Glow, known for their explosive live performances, is made up of two women-Annbidextrious, on bass/guitar and Katha (kay-tha) on drums, with both harmonizing on vocals. The sound created by these women is massive as if listening to a five-piece band. Katha's musical background is guitar, in which she incorporates in her drumming style; Annbidextrious' background is bass & vocals-she embellishes the sounds of bass and guitar simultaneously. The sonic guitar sounds and alternate tunings have been compared to Sonic Youth, but vocally the band has been compared to Patti Smith, PJ Harvy and Siouxsie Sioux. The drums have their own original sound, somewhat tribal and very heavy and strong. The sound created by Mongoloidian Glow will take you to a different time and space, and it will be kept safe in your own mind.